We Handmaids have been given to understand that there is no lack of resources on the web, print, television, and social media venues describing in detail and ad nauseam the failings and mistakes of priests of every stripe, highlighting everything from lesser virtues to low quality vestments. Complaining about Father will not change him. Praying is the solution. Don’t pray he starts doing what you want. Pray he does what God wants – always. Tired of hearing bad things about priests? Good – so are we. So we decided one day, as we shared re-creation talking over the dinner table and recounting the many good priests we’ve encountered over the decades, to list just some of the hidden gems in the lives of priests that God has allowed us to peek into. These are reminiscences, examples from our lives before the monastery as well as from our lives as cloistered nuns. From today, yesterday, and years ago. No priests are identified. The priest, thinking he was alone of course, lying prostrate as on ordination day in our chapel doorway from the sacristy until the sacristan nearly tripped on him, thinking he’d had a heart attack. No. All was well. He was perfectly in the right spot before the tabernacle and in the right frame of mind…humble gratitude. 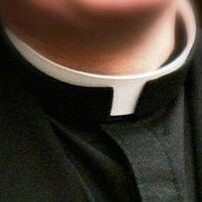 In the middle of the night, the priest still in clerics (coming in or going out to a call?) slipping into a dark corner of an Adoration Chapel so he can pray unseen…but someone else also in another dark corner did see, and never forgot. The priest, unaware or forgetting, the Chapel set up allowed us to see his feet, straining upward at the elevation until he was literally on tiptoe. The priest, trying to articulate his love for God using the word “passionate” and his voice breaks, knowing God is more passionate about him than he is about God. The priest, brimming with radiant Joy, holding the Host delicately and tenderly with the least contact and most reverence he can manage. [This we have witnessed multiple times with multiple priests…] The priest conducting a concert from the sacristy after Mass. No matter how old, tired, weary, sick, pressed for time prior to Mass, they retreat to the Sacristy to unvest and through the doorway an audio encore of the Mass hymns comes forth in hums, whistles, and sometimes outright singing. The priest who looks forward to finishing the busy day alone before a statue of the Blessed Mother. The priest who, after asking for a ride to the ER (which he needed), still makes time to pause, face a statue of Mary, and intone a sonorous Salve Regina at the end of Mass. The priest who, being crushed during a Holy Week, couldn’t hide his tears in Adoration during a communal penance service. The priest, nearly crippled from a degenerative health condition, trying not to advertise the immense difficulty he had just getting out of his alb yet graciously accepting help despite knowing he could no longer hide the suffering he had been offering Jesus all his life. The priest summing up his life, “It’s like a candle. It just burns until there’s no more.” And he’s smiling. During Communion, a consecrated Host was accidentally dropped. The priest kissed the floor. The priest so happy it is Easter, he’s bubbling over with Joy and a stream of Alleluias. If you happen to notice your priest in one of these moments and sense that he would prefer to remain unnoticed, please respect that. But ALWAYS feel free to let your priests know how much you love and appreciate them and are truly grateful for their vocations.